Welcome to my "Brown" Goon Show page. Hopefully you'll find what you're looking for hidden away somewhere in its depths. The Goon Show was a BBC radio comedy show that was broadcast in the 1950's and into the early 1960's. On 28 May 1951 the BBC broadcast a show called 'Crazy People' which contained many of the characters in later 'Goon Shows'. For the second series in 1952 the billing was changed to 'THE GOON SHOW, featuring those crazy people ....'. From the third series on it was billed as 'The Goon Show'. The Goon Show starred Michael Bentine, Harry Secombe, Peter Sellers and Spike Milligan (Bentine left after the third series). If you get the chance have a listen to a show. To have made it this far into my page you will probably like their humour. The best reference source I have found to the Goons is 'The Goon Show Companion ... A History and Goonography' (Roger Wilmut and Jimmy Grafton). My battered old copy (Sphere Books 1977) is yellowing with age but still is invaluable. Newsgroups are always a good source of information. Try calling into these two. There's always something new to read in this newsgroup. Posts to this news group can be a bit thin on the ground. 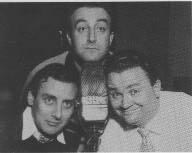 If you are lucky enough to live in Australia you can hear The Goon Show on Radio National at 5:30am on Friday mornings. You can catch a streaming audio version of a Goon Show on BBC Radio 7. 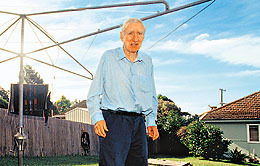 Here's a picture of Spike Milligan taken when he was trying out thistle lined underpants for the first time. This site is always under constant review .... Call back again soon! !